On the outskirt of the Provençal village of Pernes-les-Fontaines, located on a landscaped park of 3.5 hectares, large farmhouse from the 1850's, renovated in 1993/1995 and 1997, with a total usable surface of ? ?approximately 700 sqm, of which about 500 sqm of living space on 2 levels.On the ground floor: summer dining room, kitchen with scullery / laundry room, large dining room with fireplace, entrance hall, living room with fireplace, billiard room,Library, bedroom N°1 with its bathroom, walk-in wardrobe, toilet. The floors on the ground floor are made of Ménerbes stones, and large windows open onto the park.Upstairs: A sitting / TV area, office, bedrooms N°2 and N°3, a big bathroom plus wc, bedroom N°4 with shower room, large bedroom N°5 with cathedral ceilings, stone floor, with bathroom, walk-in wardrobe and separate wc.Perpendicular to the main house, building of 120 sqm on 2 levels, structural work done, interior to be defined.Outside: park of 3.5 hectares, landscaped, alley of cypress trees and yew trees, secular plane trees, olive trees, fig trees, lawn, lavender. 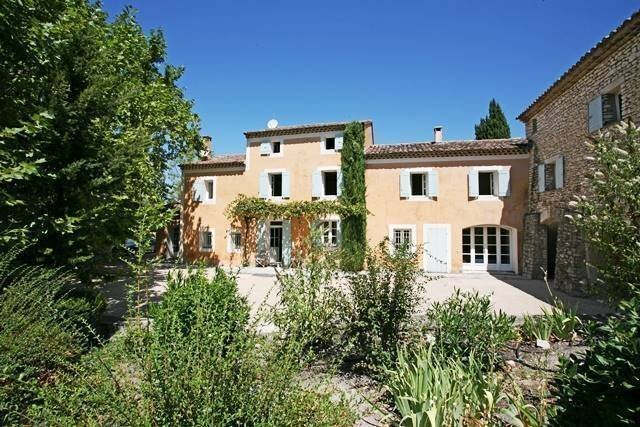 Swimming pool in concrete of 10 x 5 meters, armored wine cellar, sheds.Utilities: septic tank, city water, connection to the channel of Carpentras possible, well, electric heating, wood frames, double glazing, alarm.